Back in 2044, with the forest only a few hours away, a frantic Jones works to bring the crew back. Cassie is the first to disappear and just before Ramse does, he grabs a piece of the chart on the wall. Cole is last to splitter back and when he does, he immediately orders Whitley to put Jones and Ramse in handcuffs. Ramse tries to explain that with what they learned, they now have enough to find the Witness but Cole isn't even close to having it. At this point, Cole feels betrayed by the two he trusts the most. Cole isn't the only one on 12 Monkeys who feels betrayed however. We then shift to Olivia, who seems to have healed from her injuries as a legacy of being created with strong healing abilities and extended life. Olivia is absolutely disillusioned with the Witness and is done being is pawn. To signify that, Olivia plays a visit to her mother's final resting place to say goodbye. Imagine if Olivia uses her powers for good. 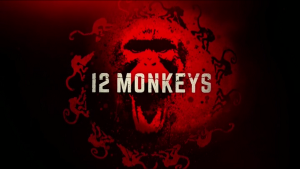 This week, 12 Monkeys is guilty of appropriating an atrocity - the holocaust. In the universe of the 12 Monkeys, a major impulse behind the medical experimentation of people in concentration camps was to build a genetically superior human who would be more resistant to illness, have increased longevity and increased ability to heal. For the 12 Monkeys, the inhuman medical experimentation and death camps were just a writing device the writers could invoke to explain the existence of Olivia. It's beyond gross to use the death and torture of millions as some plot point. We are almost through season two and though I wouldn't call it a complete retcon at this point, it's pretty damn close. What happened to all the concern about the virus and the destruction of humanity? The only one to really show us that the virus still matters is Adler and that had to wait until this episode. All of season two has been about tracking down the Messengers and the Witness. When added to the fact that the 12 Monkeys is a time travelling show, it is so confusing. The characters don't reflect often on how many people died during the virus and continue to die because of a lack of immunity to a mutating virus. The virus is now treated as a side effect of The Witness being alive and not a problem in and of itself. When Gale starts to talk about looking at his granddaughter and only seeing ashes it is heartbreaking. In this moment the weight of foreknowledge is a heavy burden and we can see just how much it has cost him throughout the years. It also serves to give us a real idea of just how isolating this knowledge is for Gale and forces the viewer the put themselves in his situation. This is 12 Monkeys at its best and unfortunately, scenes like this are few and far between. At this point, I don't really care what happens next. I know I was supposed to get excited about Cassie and Ramse working together to outsmart Cole and the concern they showed for each other during interrogation but it just didn't happen for me. I don't really care about the interpersonal relationships of the characters. I don't know what 12 Monkeys could do at this point to scare up any kind of interest from me, but invoking the holocaust in the fashion they did certainly didn't accomplish it.